Why Are There Rainbows on the Tunnel Between S.F. and Marin? Anyone who has driven between San Francisco and Marin on Highway 101 in the past half-century has made the journey underneath a rainbow, regardless of the weather. Jessica Schimm often rode through what was then known as the Waldo Tunnel (named after 19th century California politician William Waldo) just north of the Golden Gate Bridge when she was a kid growing up in San Francisco. Why are there rainbows painted on the tunnel and who painted them? “My dad commuted there every single day,” says Robert Halligan Jr. The Halligans lived in Marinwood at the time, and Halligan Sr. thought it would be great if there was something a little nicer to welcome commuters driving back to the North Bay at the end of the day. But Halligan Sr. was not your average commuter. He was also the public affairs officer with the California Department of Transportation, and he had a flair for the creative. At the time, the Bay Area was opening a lot of new freeways, and Halligan Sr. put his creative mind to work. His son says he had a Silicon Valley robot clip the ribbon at one ceremony and had a local traffic helicopter drive through the ribbon at another. This was also the time — the 1960s and ’70s — when highway planners were thinking a lot about the aesthetics and design of the roads they were laying down. Californians were spending a lot of time on the roads, and people thought it would be nice if those roads were a little more beautiful. So when Halligan Sr. proposed painting rainbows at the entrance to the tunnels in Marin, his colleagues said they were on board. “The rainbow tunnels were simply part of that kind of experience, trying to improve the aesthetics of concrete in people’s lives,” Halligan Jr. said. But it wasn’t just their colorful presence that made rainbows the right choice. Halligan Jr. says the half-circle shape of the tunnel openings made a rainbow “naturally conducive” to the project. When the rainbows first went up, most residents loved them, but a few hated the new paint job. The two sides battled it out in the Letters to the Editor page of the San Rafael Daily Independent Journal. “Did a muse, en route to an appointment with Andy Warhol, veer off course and land in the Division of Highways? 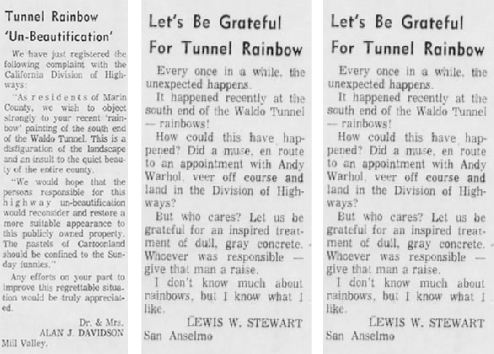 Let us be grateful for an inspired treatment of dull, gray concrete!” countered Lewis W. Stewart of San Anselmo on Nov. 10, 1970. 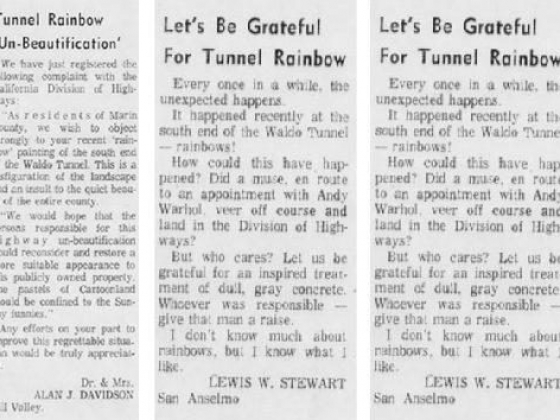 Residents debated the new rainbow design on the Waldo Tunnel in letters to the editor in San Rafael’s Daily Independent Journal in 1970. “My dad used to say if it’s not controversial, it’s not art,” Halligan Jr. said. And he didn’t stop caring about his controversial artwork. When it came time to give the rainbow a new paint job, Halligan Sr. was not impressed with the work. Ultimately, Halligan Sr. considered the rainbow tunnels to be one of the best things he accomplished during his career. When he died in 1999, the San Francisco Chronicle even mentioned them in his obituary.